If you haven’t noticed, I have posted these on my insta-stories sooo many times – because they are THAT good!! In the last 2 weeks, I have made them 3 TIMES! Visitors have requested them and devoured them and I’m certianly not complaining. Nothing better than happy friends and happy tummys. As a child (and even adult) Cherry Ripes were def a fav of mine. So i came up with changing the cherries for raspberries (to accommodate Low FODMAP) and they honestly taste better. 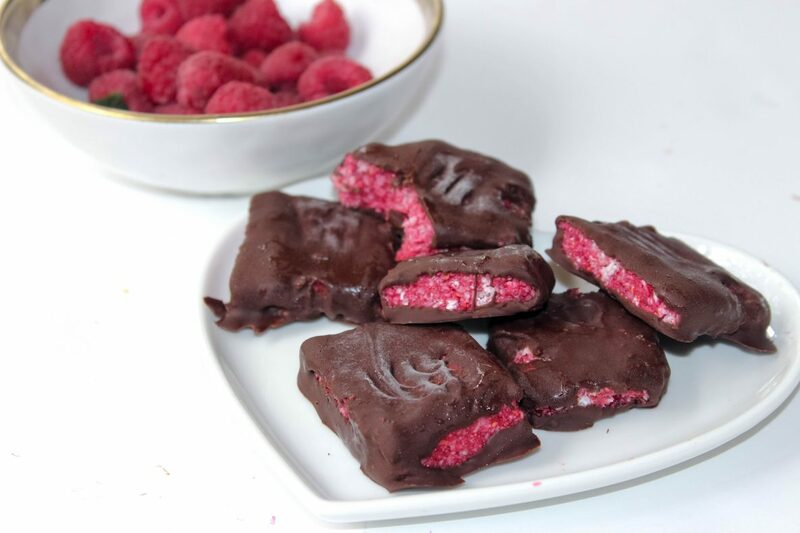 The raspberries give them a slight tartness which is super refreshing with the dark chocolate. These bad boys will curb your chocolate fix and you can even scimp on the honey so there is no added sugar. Empowering busy women to THRIVE not just survive in this demanding world! From Smoothies to Self-Care! Plus NEW RECIPES EVERY WEEK! DO YOU KNOW SOMEONE ELSE THAT WOULD LOVE THESE DELISH TREATS... SHARE THEM! Line a square tin (approx 20cm) with baking powder. cut corners for easy removal. In a food processor place, coconut, coconut oil, honey and vanilla. Blend at high speed until well combined. Finally add your raspberries and blend all ingredients together. When ready, melt chocolate over the stove. Whilst melting, remove the mixture from freezer and slice into squares. Using a fork coat each side of the square in the melted chocolate and place back on to baking paper lined tray. Once all have been completed place back into freezer. The trick is to keep the mixture as cold as possible for them the set whilst coating them. If the mixture becomes to warm, place back in the freezer and start again.